Just how similar is Snow White to Snow White? 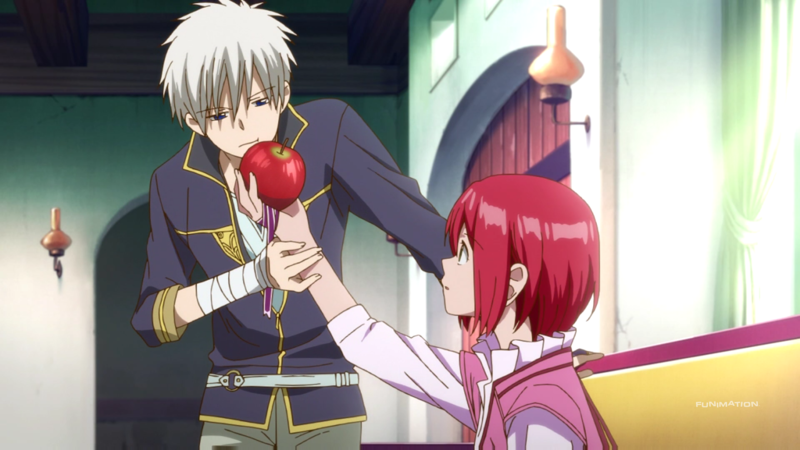 Akagami no Shirayuki-hime, or in English, Snow White with the Red Hair. A peculiar title since half of it is not even its own. Of course, this anime’s title is derived from another animation, and quite the famous one at that: Snow White and the Seven Dwarfs. Most people have heard of the movie. Snow White, a maid working for the Queen, evades her demise, helps a group of dwarfs, and lives happily-ever-after. For those that do know of the movie, they most likely ask themselves a simple question when the name of the anime is heard. Exactly how much is Snow White with the Red Hair similar to Snow White and the Seven Dwarfs? Before the actual investigation can begin, another important question needs to be answered: is one “allowed” to even compare Akagami no Shirayuki-hime to Snow White and the Seven Dwarfs? Sharing a title does not automatically invite someone to compare the two pieces. Coincidence and accident are explanations for why the titles are as similar as they are. Along the same lines, these explanations can be explained away. Coincidence is too random and accidental is too far-fetched. This is, after all, a Japanese anime sharing a title with an Americanized version of the German children’s folklore. It would seem, then, that the choice of the title is neither coincidental nor accidental. It is deliberate on the part of the creators. Assuming that comparing Akagami no Shirayuki-hime and Snow White and the Seven Dwarfs is allowed, a problem already occurs. The second half of the title would claim that the two are nowhere near similar. 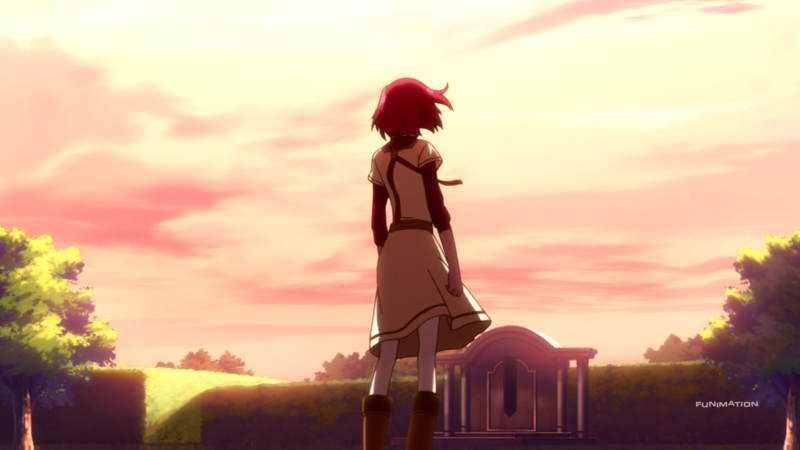 Shirayuki, the main protagonist, has signature red hair, unlike the black curls of the other Snow White. Their personalities are also different. Shirayuki is forward and independent whereas Snow White is dainty and submissive. 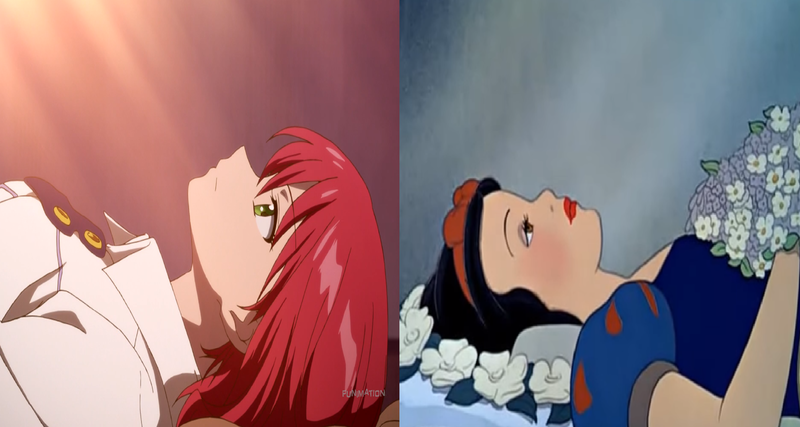 Shirayuki and Snow White further differ in their capabilities. Instead of the stereotypical cooking and cleaning, Shirayuki is a prodigy in the study of herbs and medicines. Having the two main protagonists be as different from one another as they are starts the comparison off on the wrong foot. Other details are missing between the anime and the film. A distinct lack of dwarfs surely indicates that the anime and the film are different. Ryuu is the only character who is short in stature, but that is because he is a child and not because he is a dwarf. Another large difference is that there is no evil queen seeking to harm Shirayuki. In fact, Shirayuki has almost no family of her own to speak of let alone a vile stepmother. Besides missing companions and family members, there are also no musical numbers – like the classic carol the dwarfs sing – within the anime. A dissenter might argue that the opening and ending songs represent these musical numbers. However, since they are sung at the start and finish of every episode rather than within the episodes themselves, the argument starts to break. Furthermore, musical numbers are (usually) unique, sung or played exactly once. The OP and the ED are not unique instances; they are played multiple times during the course of the season, subsequently shattering the argument. This difference, taken together with the others, makes these two Snow White tales presumably incomparable. …Or so it seems. Connections exist between the Bones-made and Disney-originated pieces, connections that someone does not necessarily have to look hard to find. The most obvious are their names; “Shirayuki” roughly translates into “Snow White.”  Another obvious similarity is the poison apple. In both stories, poison apples are used to attack the fair maiden. While one of the plans succeeds and the other does not, using self-poisoned apples as a weapon is too similar to disregard. Speaking of attackers, the antagonist is, like the Queen of Snow White and the Seven Dwarfs, royalty preying on someone of a lower social status. Again, this type of similarity – especially considering that both women are targeted for their beauty – is too much to ignore. Zen is yet another similarity. Zen, Shirayuki’s love interest, is a prince who sees and falls in love with the woman of his dreams. This matches the American film, whose own prince similarly sees and falls in love with the woman of his dreams. Already the comparison is starting to look a bit better. If you do look hard, subtler similarities can be gleaned. 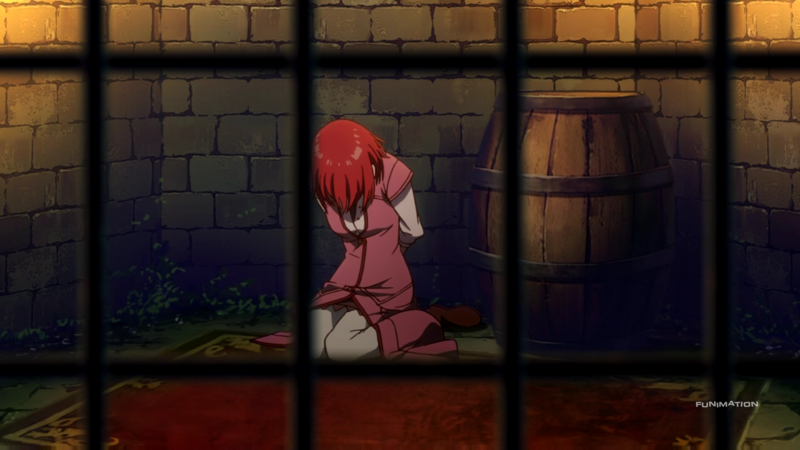 For example, the previous observation that seven dwarfs are not present in Akagami no Shirayuki-hime still stands, but analogy would say otherwise. 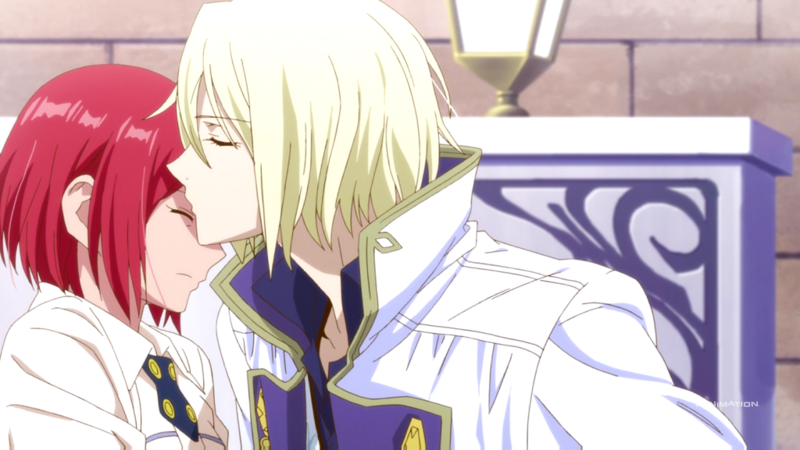 Not counting Shirayuki and Prince Zen, there are seven other prominent members of the cast who, willingly or not, are connected to the two lovebirds. Chief Gazalt (the head of medicine in the castle), Prince Izana (the stern older brother of Zen), Mitsuhide (the smiling guard), Kiki (the mellow guard), Ryuu (the reserved young boy), Raj (the sickly prince), and Obi (the carefree servant). These characters share similar qualities to the dwarfs, namely Doc, Grumpy, Happy, Sleepy, Bashful, Sneezy, and Dopey, respectively. Another subtle nod to the original tale is the climax of the first season. Zen leads Shirayuki to a secluded and special spot in the castle’s nearby forest to ease her heart. There, they profess their love for one another, culminating in “love’s (second) kiss.” This scene parallels the one in Snow White and the Seven Dwarfs; the prince, in a secluded and special spot in the forest, kisses Snow White to release her of the evil spell placed upon her. This and the other subtle similarity require a tiny bit of logical stretching, but these similarities are not so crazy that one can outright deny their existence. How about on a broader scale? 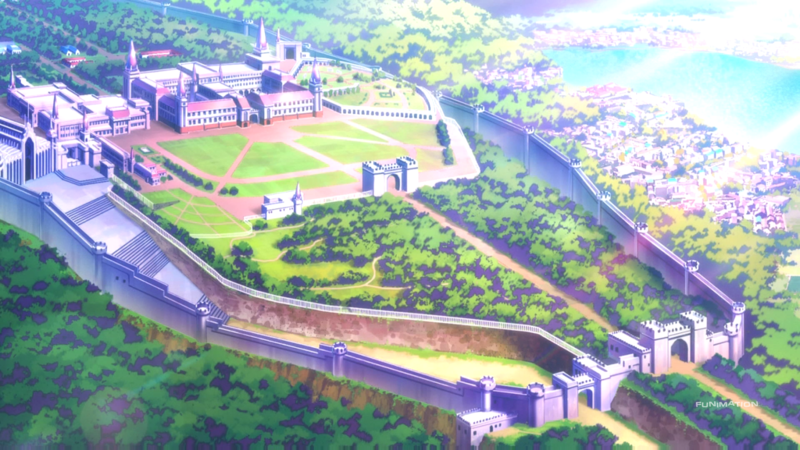 The anime, much like the movie, presents itself as a fairy tale. Not just in the sense that the damsel in distress is saved by the prince time and again, but in its visuals as well. The bright lights, the pretty colors, and the medieval backdrop give Akagami no Shirayuki-hime a fantastical feel, much like the peppy woodland creatures, the cottage-in-the-woods, and the glass coffin did in Snow White and the Seven Dwarfs. The narrative, in contrast to the visuals, argues in the opposite direction. Snow White is a woman who has no control over her life. She is persuaded by the huntsman, she is manipulated by the Queen, and she is rescued by the prince. At almost all points throughout Snow White and the Seven Dwarfs, Snow White is influenced by the people around her. Shirayuki is similar in the sense that she, too, is aided by others, but she regularly makes her own decisions. She chooses to run away from the first prince, she stands up to Izana, and she confesses her own feelings to Zen. Akagame no Shirayuki-hime is not a tale about a girl who is helpless and misguided but instead about a young woman who is determined to forge her own path. Any number of similarities and differences can be conjured, not just the ones listed previously. For instance, Izana, the metaphorical Grumpy, kissing Shirayuki on the forehead just as Snow White did to Grumpy and the other dwarfs can be considered a similarity. Yet, the absence of magic in Shirayuki’s story is a glaring difference. 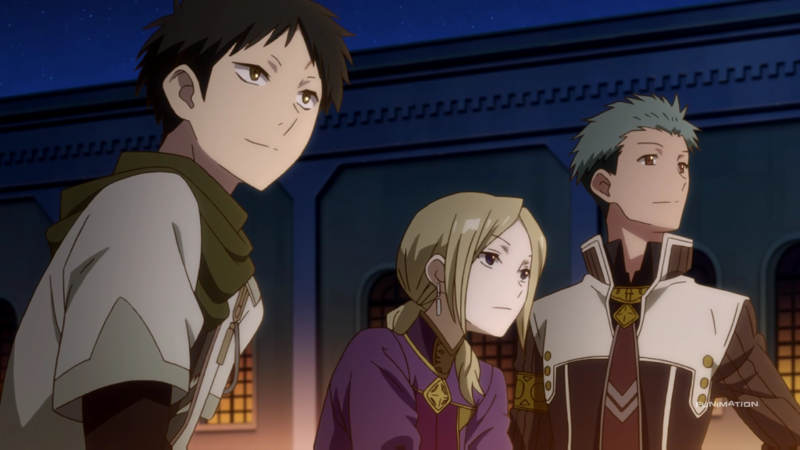 Considering the second season to Akagami no Shirayuki-hime has yet to be released, and the source material is still ongoing, even more similarities and differences will inevitably make their appearance. Regardless of how similar or different Snow White with the Red Hair and Snow White and the Seven Dwarfs are, regardless of whether or not someone is allowed to compare the two, this anime and this film will always be their own, distinct stories. So why does comparing them matter? Why should one care if both have a mute character or care about the lack of talking mirrors in one but not the other? One reason (albeit a complicated one) is that the comparisons help to discover more about Akagami no Shirayuki-hime. Who the characters are, how the tale is told, what the anime is trying to say, and so on. Indeed, this essay highlights each of these details. Another reason is to try and predict where the story is headed. 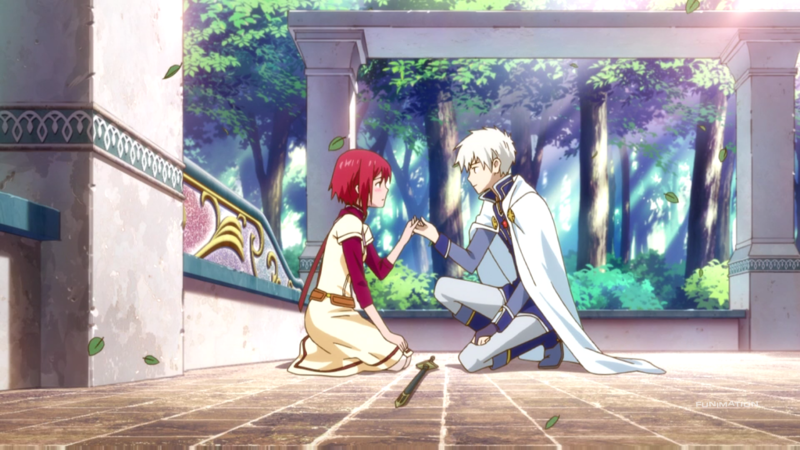 If someone believes the similarities are enough to warrant a connection between the anime and the film, guessing that the end for Shirayuki and Zen will be happily-ever-after is logical. Or maybe it is even simpler than that. Maybe the creators of the work are begging for the comparison to happen. Deliberately entitling the anime in a similar fashion to another work is practically an invitation to make comparisons. That is to say, sometimes, it is simply fun to embark on a brand new adventure. I honestly didn’t pay any attention to this show as a comparison to the Disney movie, so I missed all of the above completely. What I do know is that I really enjoyed this show, the characters seemed well written, the side cast stayed relevant (which, admittedly, is a lot easier for a 12 episode show than a 100+, but still a nice feat). Saori Hayami as the main heroine performed really well as always, and this was an enjoyable show. Let’s just hope we don’t start the second season off where the dwarves invade this kingdom, because quite frankly, even the hobbit movies couldn’t do that correctly. > …so I missed all of the above completely. I am happy that I was able to enlighten you a bit! > …and this was an enjoyable show.